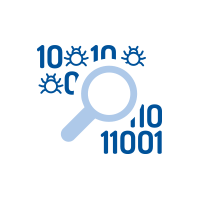 HID® Risk Management Solution is a real-time risk profiling technology that protects financial institutions against cybercriminals. It is a next generation cyber threat and fraud detection solution, based on data analytics, that protects against traditional as well as modern threats targeting online and mobile banking, transaction systems and sensitive applications. A combination of evidence based detection capabilities and behavioral biometrics supported by machine learning makes a perfect fit for combating the ever-changing threat landscape of modern banking applications. 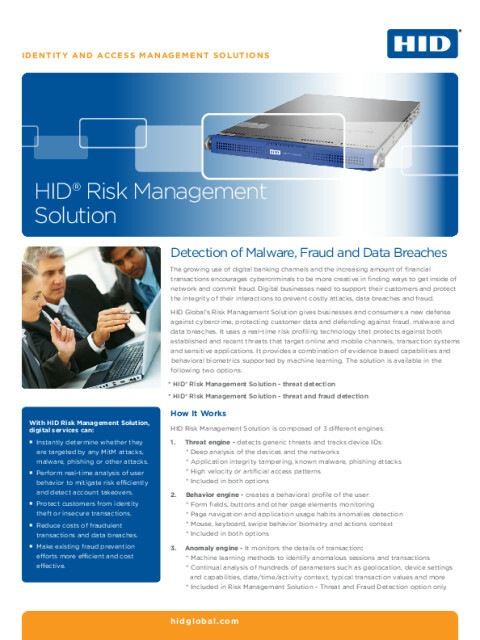 The solution is available in two options: HID Risk Management Solution - Threat Detection and HID Risk Management Solution -- Threat and Fraud Detection. Transactions are evaluated against models that includes group of rules corresponding to a transaction type, channel used, etc. It is also based on advanced machine learning that can adapt to new fraudulent scenarios not covered by rules.